Disney recently invited us to an advanced screening of Mary Poppins Returns. Check out our film review below! In case you had any doubts, Mary Poppins Returns is practically perfect in every way. The headline practically writes itself. This sequel (NOT a remake) to the 1964 Walt Disney classic is a fantastic symphony of music, color, whimsy, and Meryl Streep that is designed to do exactly what we need in the Year of Our Lord 2018: leave you feeling happy AF. Emily Blunt takes on the role of the iconic, parasol-toting nanny, starring alongside Lin-Manuel Miranda as Jack the cockney lamplighter. Both are perfectly cast, bringing humor and heart to every scene. 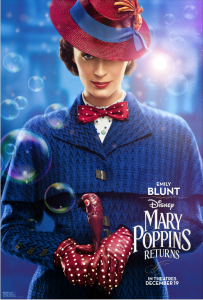 Blunt masters Mary Poppins’ blend of primness, affection, and wit, while Miranda embodies the word charisma. Both Poppins and Jack come to play a central role in (what else?) looking after the Banks children – not only the now-grown Jane and Michael Banks (Emily Mortimer and Ben Whishaw), but also Michael’s three young children. Adventure ensues for the kids as they attempt to help their father save their house, which is about to be repossessed. Of course, plenty of music and magic follow as well – along with more than a spoonful of throwbacks to the original film. The musical numbers are ambitious and often dazzling, from the “Step in Time”-adjacent “Trip a Little Light Fantastic” to the fabulous cabaret number “A Cover is Not the Book.” The former also feels like the perfect uplifting tune for those days when you’re down in the dumps. The costumes, the choreography, and the clever use of animation and special effects create an overall sense of wonder throughout. The larger-scale numbers are also balanced with more tender moments that definitely have the potential to bring the tears. Mary Poppins Returns can’t fully capture the essence of the original, as hard as it tries – but it gets really, really close. It also wouldn’t be fair to expect the movie to surpass one with more than 50 years of nostalgia going for it. That said, I think it’s exactly the kind of movie we need right now – one that takes its artistry and legacy seriously, is great for the whole family, and feels like a warm hug. Those who grew up watching and loving the original will get the nostalgia they’re looking for, while younger audiences are sure to be captivated by the magical things that happen when Mary Poppins comes to town. You’re left with the sense that you don’t have to be a kid to recapture the wonder of youth – and that there’s nowhere to go but up. I’ll take that message any day. Poppins is Paddington 2-esque in the feels department. And while that film and this one both share talking animals and Ben Whishaw, Poppins also has a Russian-accented Meryl Streep swinging from an upside-down chandelier. Again, this is the movie we need right now. Mary Poppins Returns releases in theaters on December 19th.